Turf is being installed on various campuses as a sustainable alternative to grass and to save water. 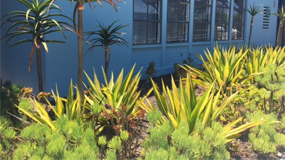 The District is committed to using drought resistant, low-water landscaping when possible as an effort to reduce water and implement native planting. Permeable landscaping and bio swales are also designed in district campuses to reduce water-runoff pollution into the ocean and ensure water is able to percolate into the ground.